Diacom Marine is a powerful Windows based diagnostic tool that is revolutionizing marine engine service. With advanced engine control systems now standard on nearly all gasoline inboard and stern drive engines, you need a service tool that pinpoints problems quickly and accurately. Diacom Marine unlocks the computing power of your notebook PC and provides state-of the- art features that simply leave other diagnostic tools in it’s wake. Version 6 software update available! Developed in conjunction with MerCruiser engineers, this self-contained diagnostic tool displays complete EFI system information allowing you to quickly pinpoint engine related problems. The tool performs a complete range of EFI system tests and also contains a built-in programmable fuel injector tester. This tool is the choice of MerCruiser and independent marine dealers worldwide. 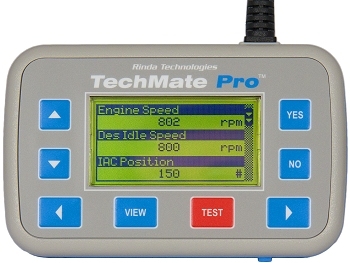 TechMate Pro is our new generation diagnostic scan tool built for professional marine service applications. The TechMate Pro supports the widest range of marine engines in the industry. Built using the latest flash based microprocessor technology the tool features USB connetivity for easy updates, a high visibility multi-line graphic LCD display viewable in direct sunlight, SD card slot for system expansion, ergonomic soft-touch / anti-slip exterior for assured handling in marine environments, a water resistant key pad along with a host of other features. Used in conjunction with the Mercruiser Scan Tool or Diacom Marine software, this adapter kit contains all the adapters needed for connection to the different modules supported by the Scan Tool and Diacom Software. Included in the kit are: Thunderbolt V (1) adapter, 2.8L 4.3L 7.3L D-Tronic Diesel (2) and Mercury Outboard (2) High Performance adapters. 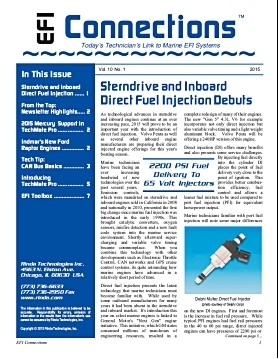 Read about the latest systems from marine engine manufacturers and keep abreast of upcoming changes in engine technology. Version 6.0 has been released! Scan Tool Update Installation Guide! Be sure your diagnostic tools are equipped with the latest software. Version 6.0 software has been released for both the MerCruiser and TechMate scan tools. The software provides many new features that will assist you in your diagnostic work. If you are not sure which version of software is currently running in your scan tool, you can find out by observing the tool's display screen when it is initially powered on. A new revision of Diacom plus software is also available which supports new electronic systems released by MerCruiser and other marine engine manufacturers. Please contact us for more information. Flagship Marine Indmar Engine Corp. Copyright (C) 2018 Rinda Technologies Inc.